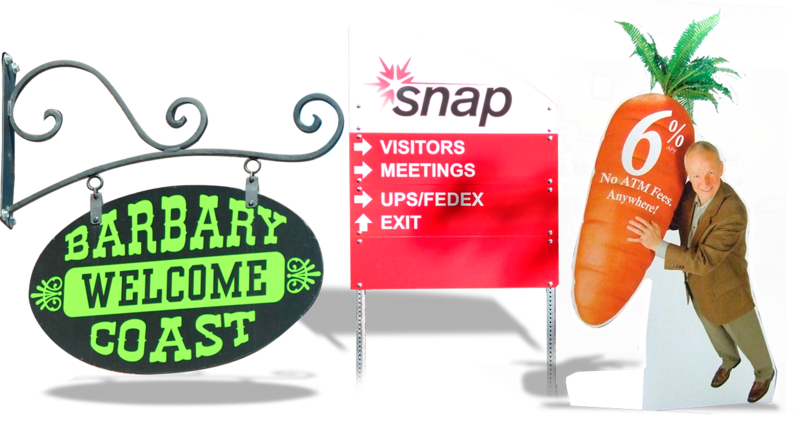 “Rigid Signs” is a term we use loosely for digital printing on just about any surface imaginable. Rigid Signs include everything but highly pliable materials like vinyl or canvas, and with large-format flatbed printing available, we can print on anything from raw wood to diamond plate metal. If you don’t see what you would like to print on, give us a call and we can brainstorm your ideas with you. The most commonly used materials are included and described in our products pages. They include corrugated plastic (also known as coroplast), PVC, DiBond, Aluminum, MDO Wood, Plexiglass, Lexan, Acrylic, Foamcore, Fiberboard, or Styrene. To create a well-rounded advertising campaign, use rigid signs in conjunction with other advertising methods, such as vehicle wraps, window graphics, dimensional letters, and promotional items. There are a wide variety of materials and substrates to choose from.